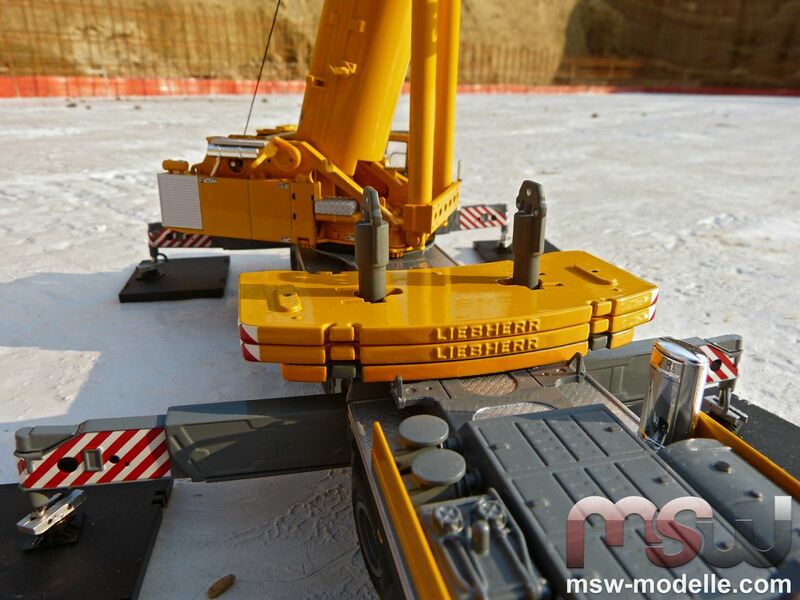 For quite some time model collectors always were longing for this model and it was Bauma 2013 when WSI made this LTM 1500-8.1 model dream came true. 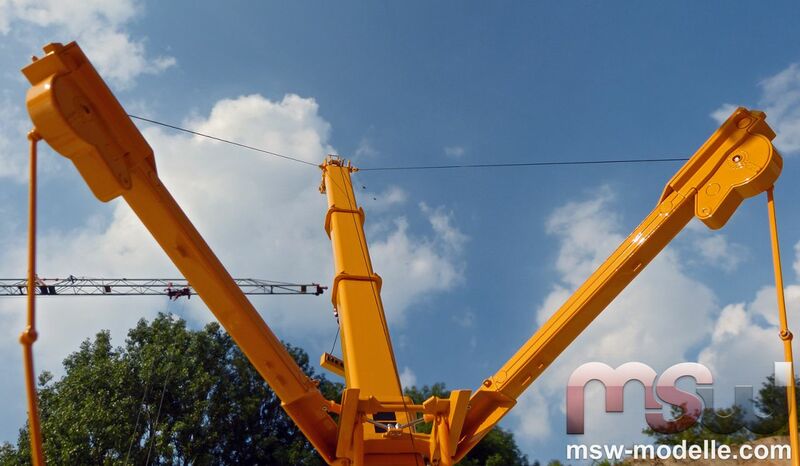 Fully equipped with both 50 m and 84 m boom options including the Y-guying system, the model is available. It was the year 1998 when a big success story had begun. Liebherr introduced the all-new 500 t capacity crane at Bauma 1998. 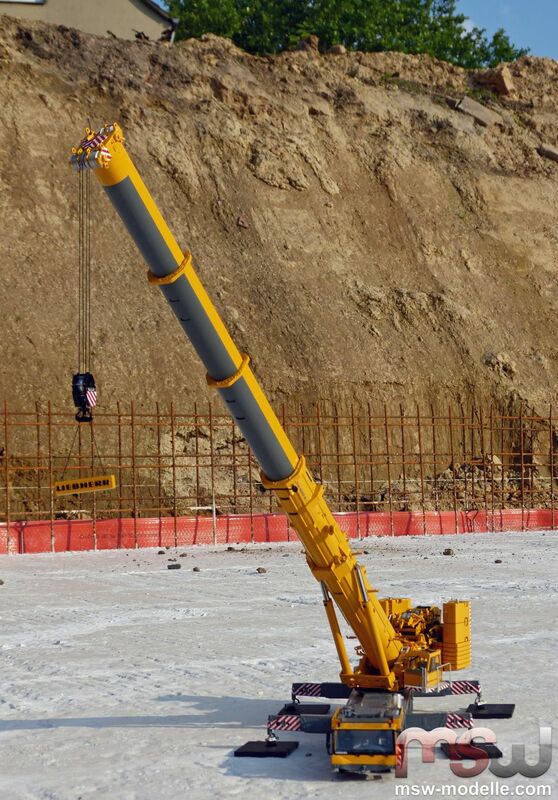 The crane came with an incredible 84 m boom and started that year its way to a real success story. Only 10 years later serial number 200 was sold and another 5 years later, the LTM1500-8.1 celebrates its 15th birthday, Sarens Nass – located in Bahrain/Middle East - took number 400. And WSI did its homework following some less optimal experiences with the LTM1350-6.1 model. 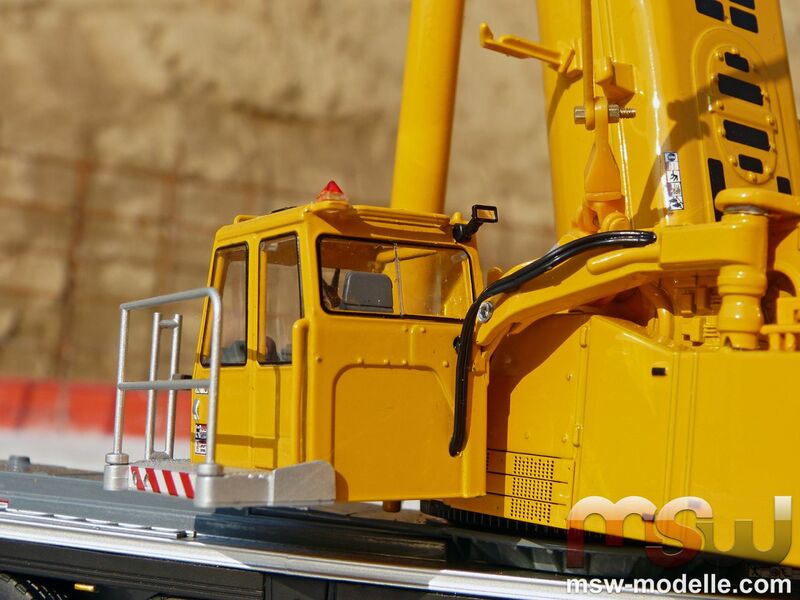 The LTM1500-8.1 model comes highly detailed, fully functional and with a unique feature never seen on any crane models. The LTM 1500-8.1 model really impresses by its massiveness, level of details and functionality. 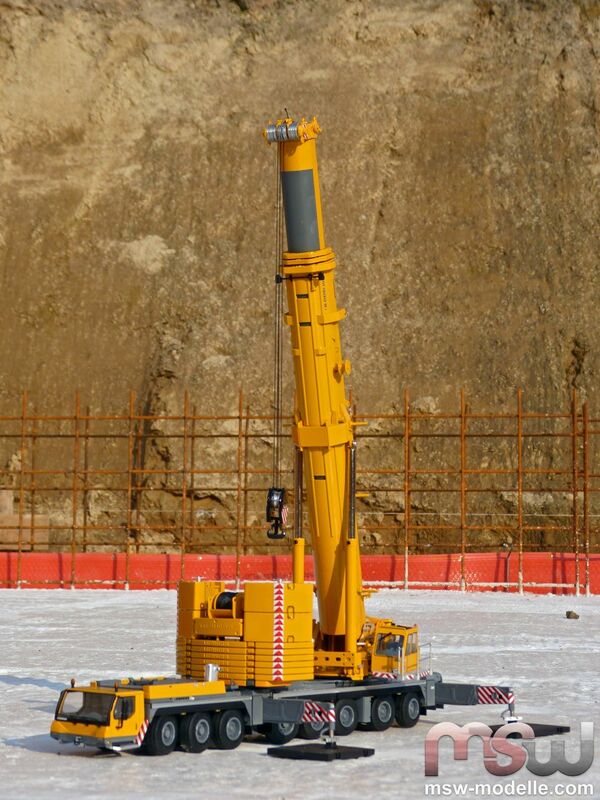 Parallel to the standard Liebherr color, the LTM1500-8.1 was also available in Mammoet colors. 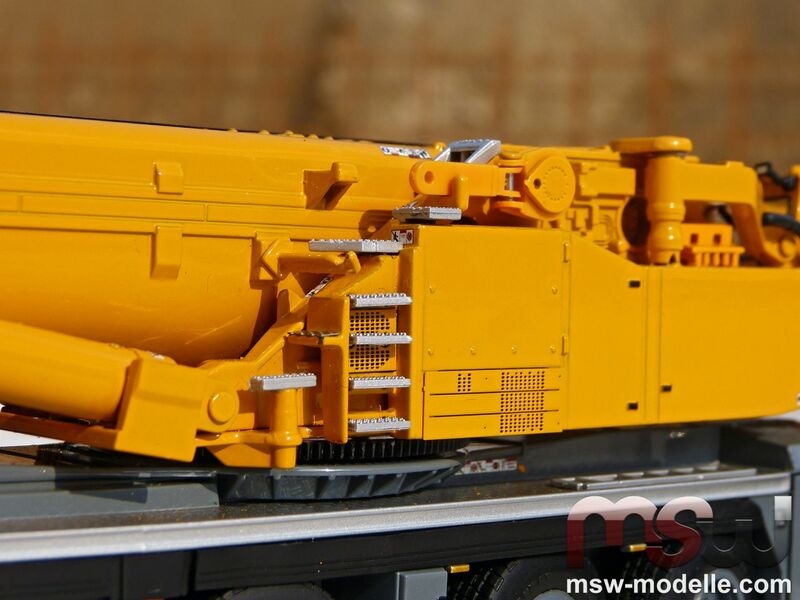 For this review both the Liebherr and Mammoet versions could be reviewed, while the pictures will show only the orgininal Liebherr colored version. As massive as the real one: the LTM1500-8.1 appears as powerful as in reality. 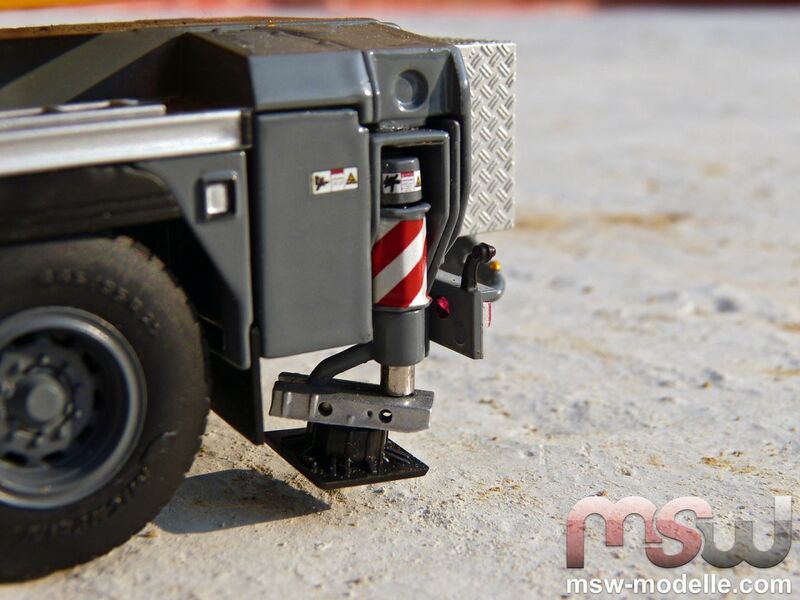 All dimensions have been transferred correctly to the 1:50 scale, for example the carrier width or the axle-base. All eight axles are cushioned and were easily moving. 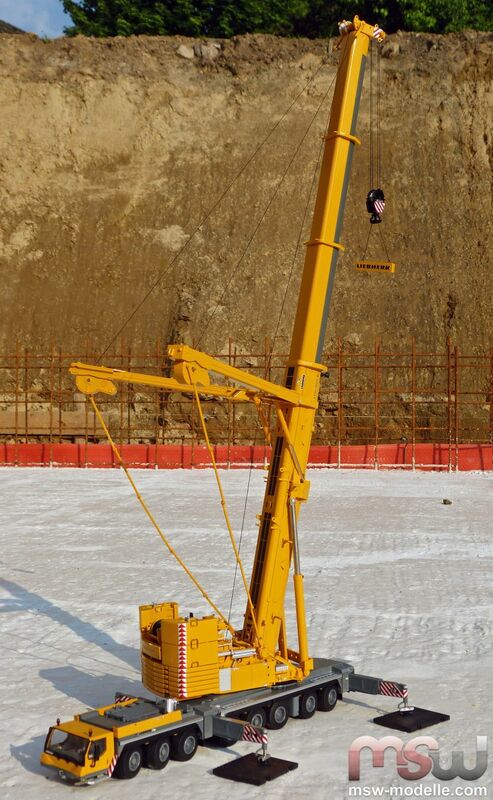 The crane can travel easily. 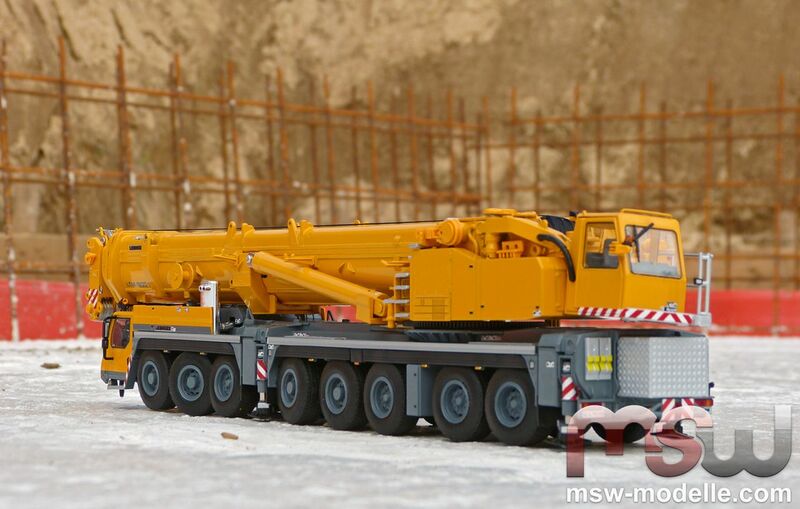 On the Liebherr version all axles could also be steered. 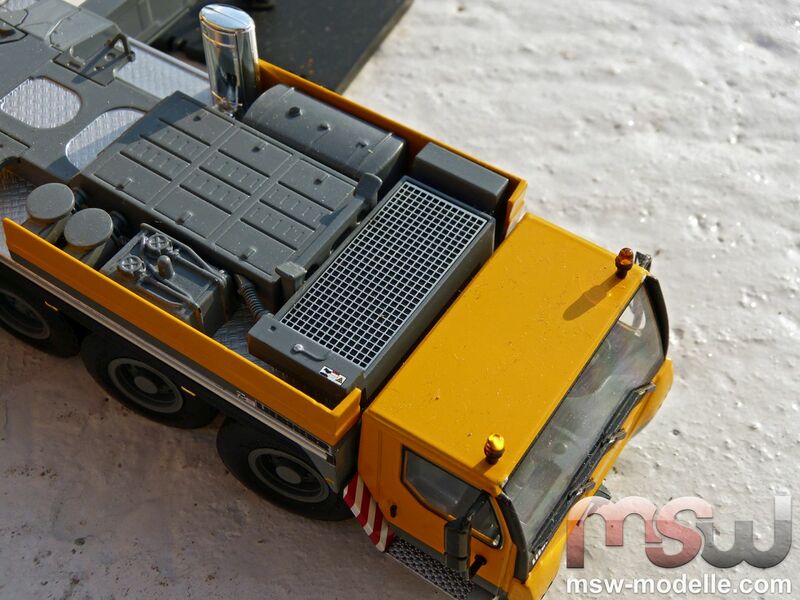 The Mammoet review model unfortunately could only travel straight forward since the steering didn’t work on all axles. During travelling the pads are retracted within the carrier width in order to fulfill the maximum width requirements. And while working the pads are fixed with a small pin. 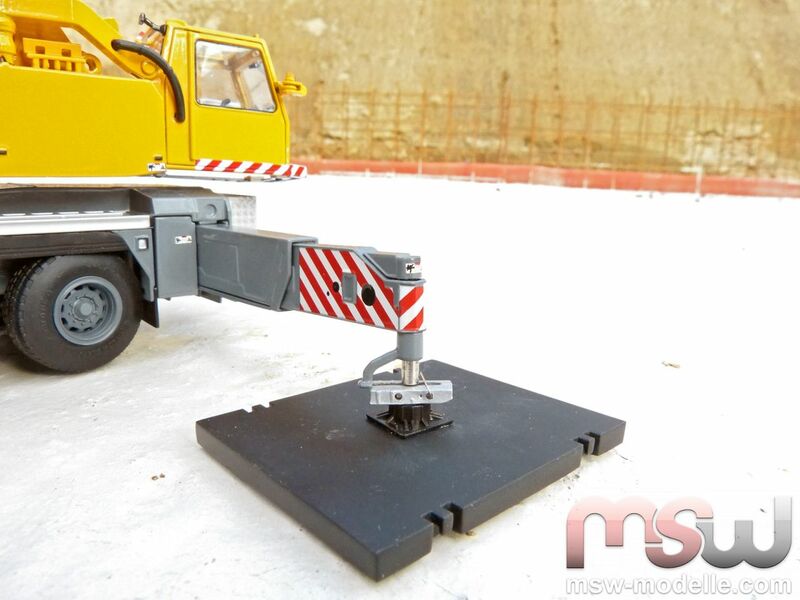 It is also a nice feature that the model already comes with right sized crane mats including their lifting eyes. The different counterweight parts are placed on the carrier. Once this is completed hydraulic cylinders lift the fully rigged counterweight into position. All real counterweight options can be displayed. The counterweight consists of 6 basic plates, each weighing 15 t in reality. This configuration would equal 105 t counterweight. With the additional two elements the total counterweight would be 135 t or 165 t. A small pin secures the additional elements on both sides. 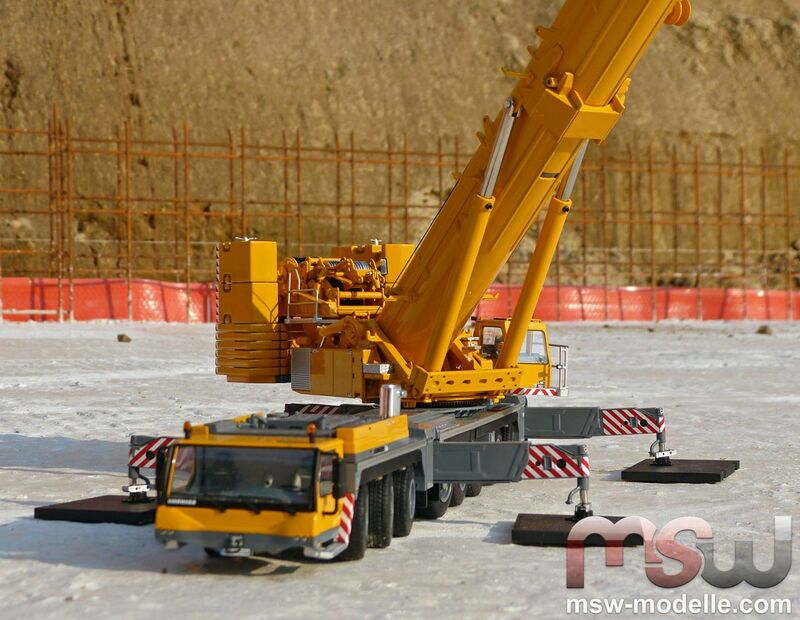 The LTM1500-8.1 model fully rigged with 50 m boom and Y-Guying system. Unfortunately all are reeved with a small looking, twisting line, which looks a little thin. 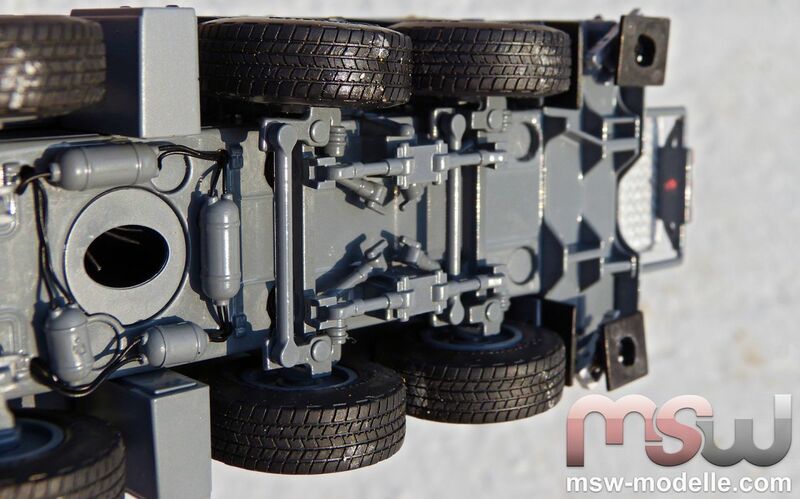 Of course MSW Modelle offers some perfect alternatives. Thicker line that is not twisting would enhance the model; the pictured one is already exchange with a better type. All three winches are fully functional. There is also a luffing block already reeved. This reeving is taken from winch two which is not correct. 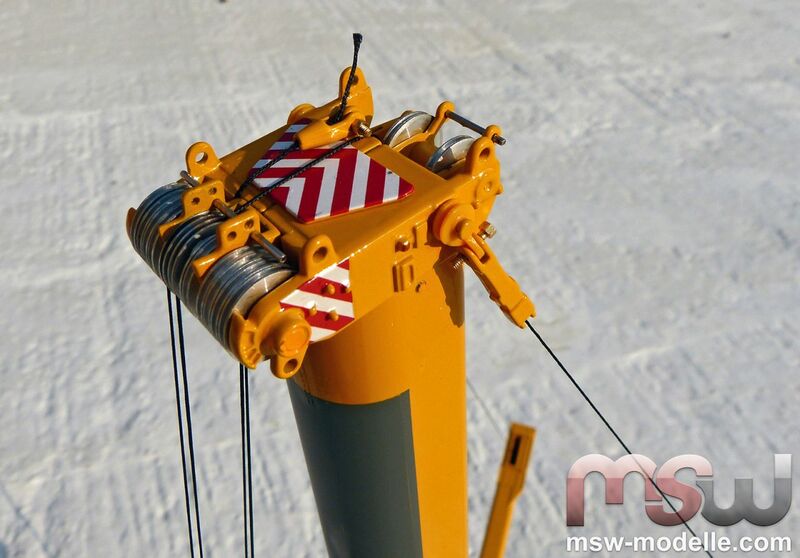 In reality the last winch, number 3, is used for the luffing jib since it also comes with more than 1000 m of rope in reality. But it really doesn’t need much time to correct this on the model and change the line. 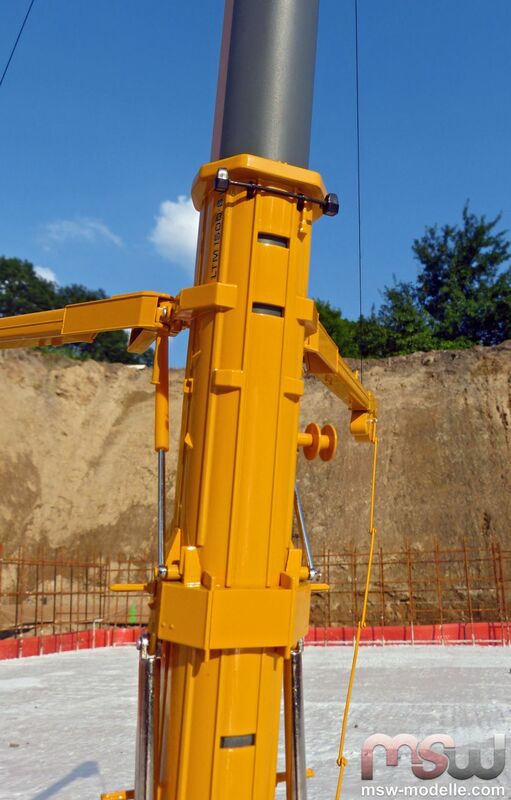 The LTM1500-8.1 comes with a Y-Guying system for increased lifting capacities. Assembly is very easy with small bolts and screws. At work without Y-Guying system and maximum counterweight. Here the mechanism looks confusing since it is not done as for example on NZG’s LTM11200 with using the key to unlock and operate. While pushing the key into the winches direction, another push from the opposite side is necessary to operate the winch. 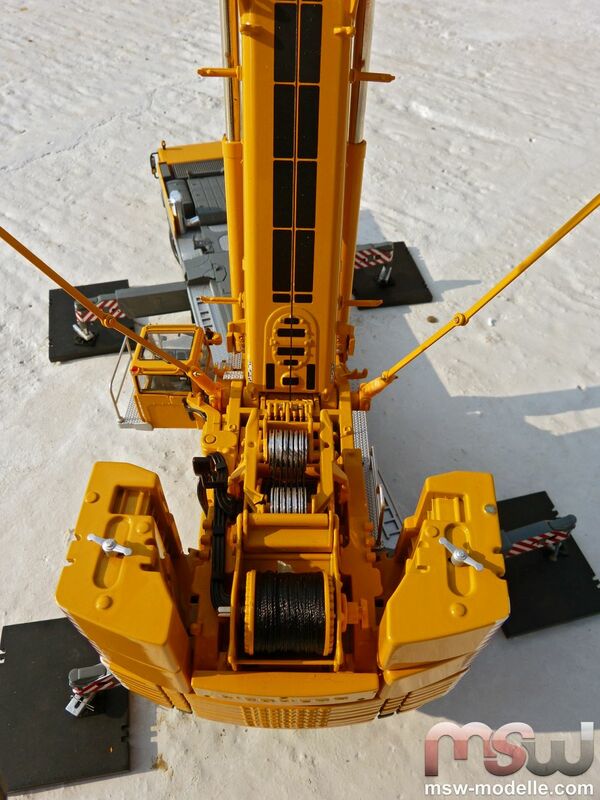 It is really great that the crane model comes equipped with three different hook block types; a 3-sheave hook (84.7 t capacity), a 9-sheave hook (which is not listed in the real crane’s brochure) and a large 13-sheave hook for 274.1 t lifting capacity. 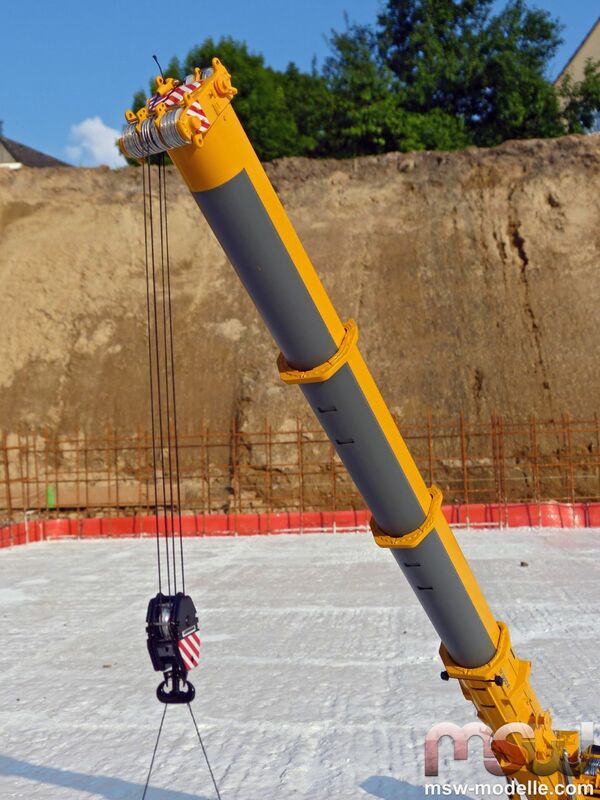 Hydraulic cylinders keep the boom in every angle; adjusting is easy and can be done infinitely. 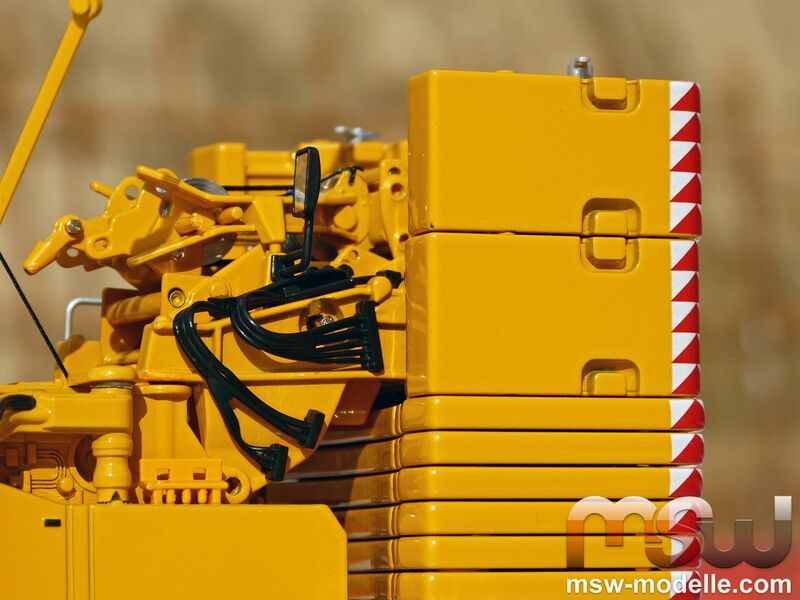 A stud screw is located on the cylinder’s front side and can be operated with a small key. But really more fascinating and absolutely new on crane models is the possibility to show the model with a boom extended in the real 46%, 92% and 100 % positions. 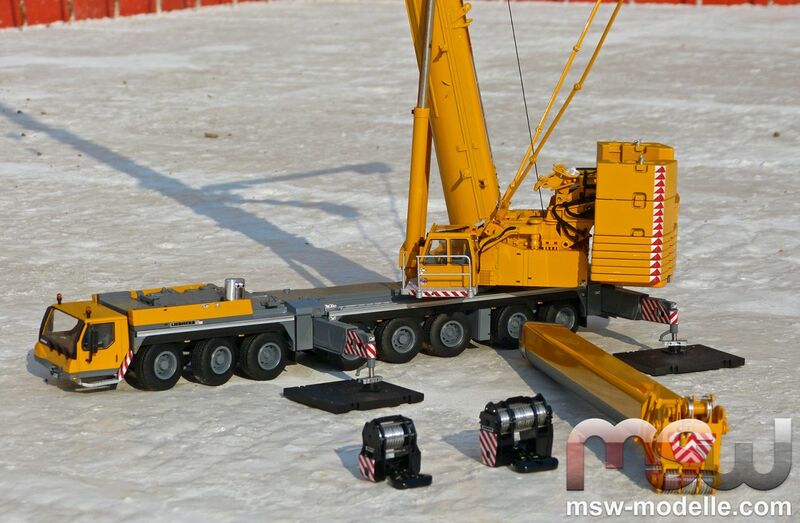 Hopefully this will become a standard on all crane models in the future. 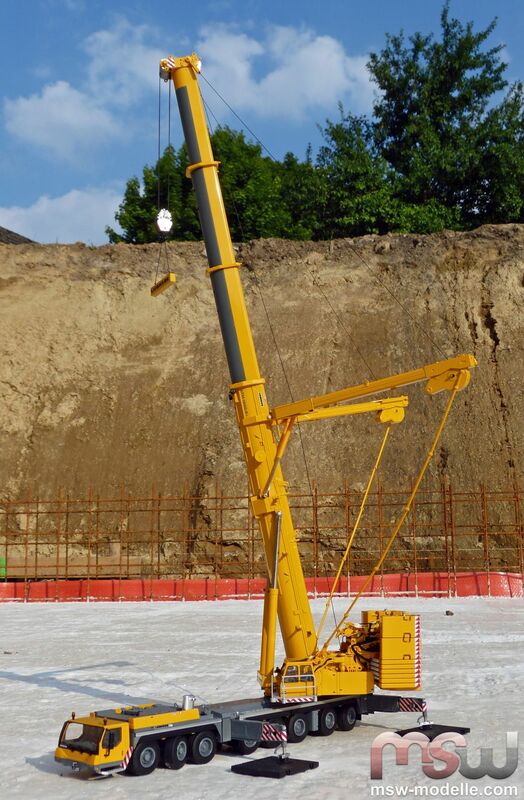 As on the LTM1350-6.1 model both 50 m and 84 m booms are not made of zinc and therefore really strike through its light weight. Therefore all proportions look really authentic. The whole carrier is covered with anti-slip surface and indicated ladders to access it. The engine cooler grid comes realistically with photo-etched covers. As all WSI models, also the LTM1500-8.1 features a really detailed inscription. Warning signs can be found all around the carrier, as for e.g. graphics on the outriggers or close to the slew ring. Small steps would help to safely access the superstructure. The cab can be tilted backwards; small hoses indicate hydraulic control circuits. Engine cooler and a chromatized muffler can be found as well. The counterweight frame is assembled backwards with two small pins. Small hoses and a small mirror complete the details on the back. All sheaves on the complete model are single type ones and rotate freely. It is only a visual question that black sheaves would look better than the silver ones.